Here is a brief list of some seminal works by Shimamoto. Whoever is interested to know more about his works may contact the artist directly or the Shozo Shimamoto Association. Quite probably the first hole made by Shimamoto. The date is written on the back and, according to the artist, it was an attempt which preceded the successful work shown to Yoshihara. Acquired by the Museum of Contemporary Art Tokyo. 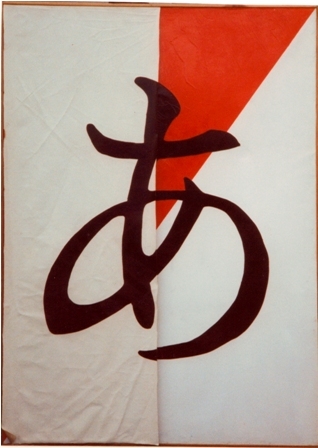 This is the initial work which Shimamoto showed to Jiro Yoshihara who then accepted him as his disciple. About two years later they founded Gutai. Tar on paper. Published on Gutai magazine 1. This photo shows the striking performance Shimamoto did in 1956 using a 5-meter long cannon to throw the paint onto a huge canvas. The cannon was set in an almost vertical position and the paint described a parabolic trajectory before reaching the canvas. Due to this, the impact was not so violent. Unfortunately the work was been discarded. 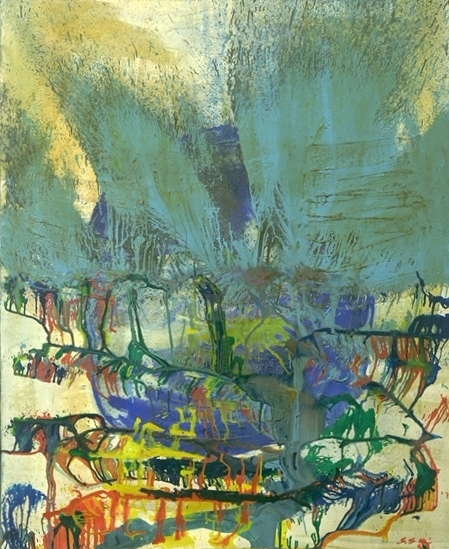 Cannon, 1956, 92 x 71 cm. Work of art realized with a cannon. This performance was more violent than the one described above. The colors were put in the cannon in separate plastic bags and then shot. Appeared in the Gutai booklet n. 5. The other two are held in the collections of Japanese museums. 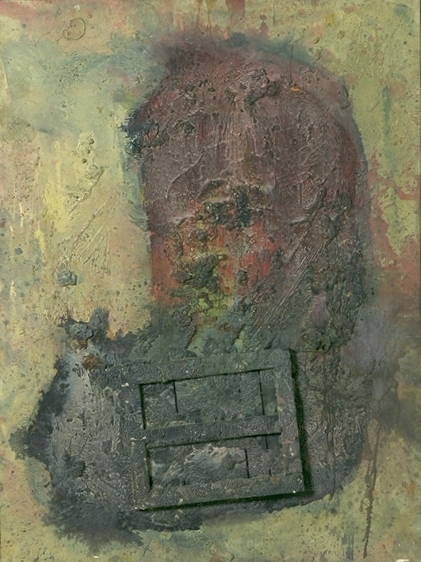 Esquisse Hole Series, 1958-1968, about 38 x 53 cm. 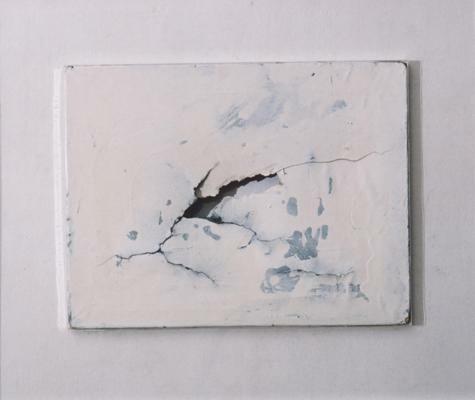 Series of works made by opening one or more holes on paper. Plaster and oil on canvas. Plaster and oil on canvas. Published on Gutai magazine 12. 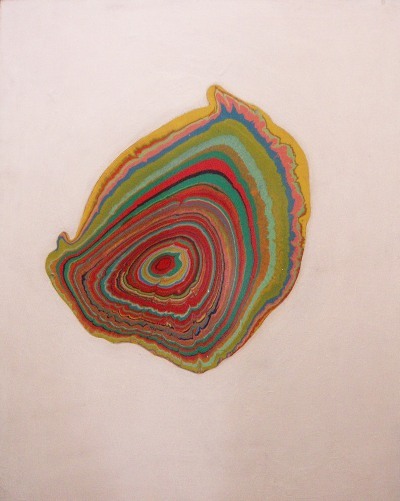 Around 1965, Shimamoto made a short series of works called uzumaki which means whirlpool. They have been basically made through the pouring of colors onto canvas, letting the colors separate according to their specific density. Some works are very large (2 x 4 m), others are little (A4 size or less). Another series from Shimamoto consists of works that have the Japanese character for “A” somewhere in the canvas. Sometimes, the background is white and the Japanese “A” stands out in the center. Here it is shown the most valuable work amongst the whole of Shimamoto's production. Sesshu is remembered in 2006 on the 500 th anniversary of his death. 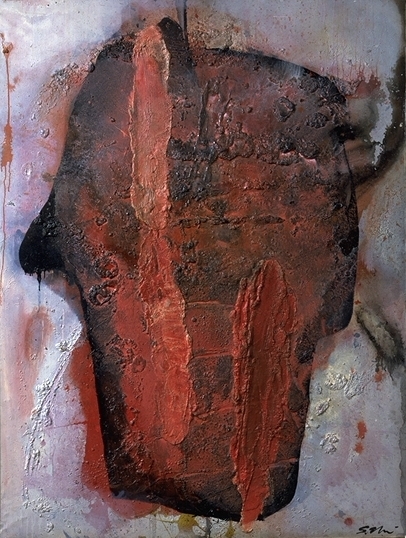 A & Sesshu, 1992, 181 x 89 cm. A work in collaboration with Professor Hirohisa HACHISUKA, who wrote the Japanese characters in order “ to live naturally ”. 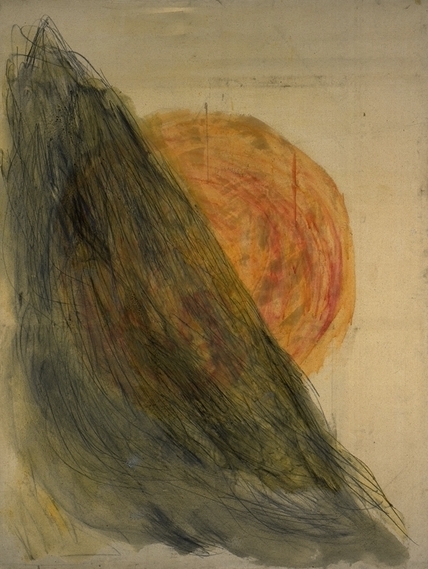 A work in collaboration with Yasuo SUMI, another member of Gutai, one of the first to join the group. These works belong to a series realized all at once during a quite famous crane performance in Itami City ( Japan ). The performance, in collaboration with the Paper-Cup Artist LOCO, consisted of dropping colors contained in spheres made of cups by Shimamoto who hung from a height of 30 meters. 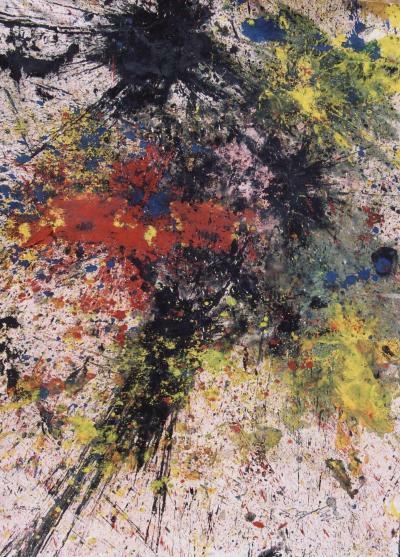 Around 1950 Shozo Shimamoto created a series of works by piercing the surface of the canvas. These works, like the various other experiments of the early Gutai, were not the result of a careful study, they were conceived almost by chance. At the time, in order to save money on materials, Shimamoto was using a screen of newspapers glued together instead of canvas, but one day he broke the surface by mistake. Fontana was producing his Cut series, studying and improving the plasticity of the cut, which he continued throughout his whole life. Shimamoto on the contrary has made many complete changes within his art, moving towards action painting, based on absolutely different a concept. 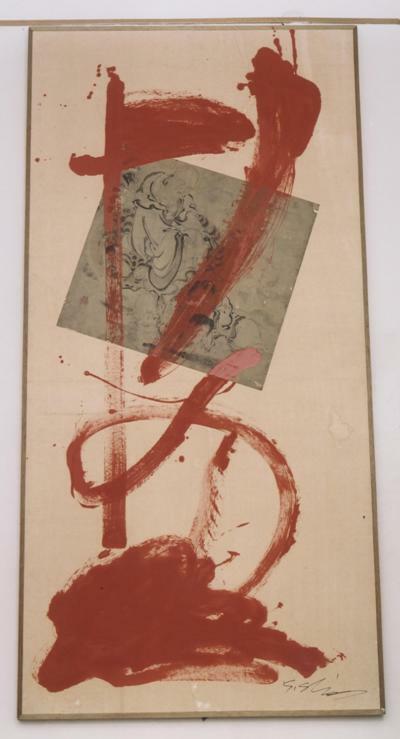 Due to this attitude, which instigated much creativity during the first Gutai period, we can perhaps say that Shimamoto's works express far more intensity than Fontana 's Cuts. Simultaneous with Fontana 's experiments in Italy , Shozo Shimamoto in Japan created the pioneering collage painting of his own Holes series (c. 1949-1952). Shimamoto began this series tentatively and modestly by gluing together layer upon layer of newspaper. Shimamoto would then make dozens of holes, first accidentally and then with greater authority. Like many artistic experiments that began as chance operations, such as Fontana's first cuts, the accident was repeated until it became a formal device that eroded the picture plane and left a record of the artist's physical action. 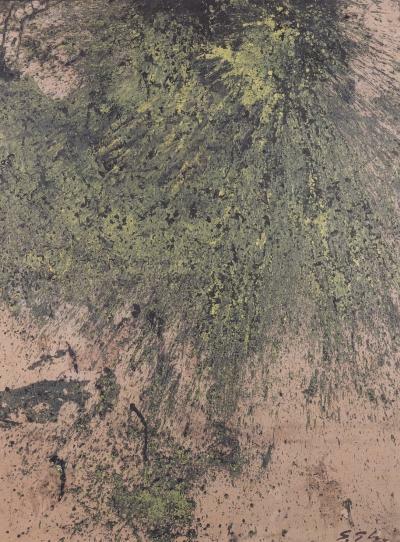 Though not as a gestural as Fontana 's works, Shimamoto's cracked and fissured surfaces do exhibit certain affinities. Yet, by his own account, he was unaware of parallel trends in European art at that time, specifically of Fontana . 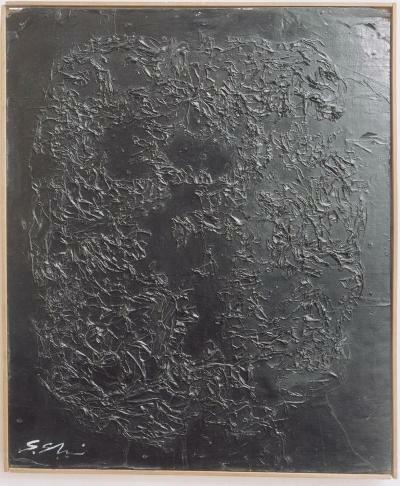 In fact he was stated that he did not discover Fontana 's work until a decade later. The fact that the dates of the newspapers he used, which preceded Fontana's Holes and Cuts, are still visible in some of the works gives credence to this assertion. Copyright(C)SHOZO SHIMAMOTO All Rights Reserved.